Finclipping this year is scheduled at Gaden Trout Hatchery, Jindabyne to start on Tuesday the 14th January 2014. Last year we had such a great roll-up of clippers that we finished all of Eucumbene's rainbows in a day! As such, I would plan to attend earlier in the week as often the work is done and there is nothing for volunteers who turn up on Thursday/Friday to do. We will provide lunch, morning and afternoon tea on the day(s) of clipping, so if you feel like helping trout research and can spare a day, a few hours or whatever you like, feel free to join us. There is plenty of time to talk trout with a plethora of like minded people, in the very pleasant Gaden environment. DPI staff are on site setting up Monday afternoon, but all the action takes place on Tuesday and Wednesday, where we start about 8.00-8.30am. As per last year, DPI staff will be using the coded wire tagging machines to tag the 50,000 trout to be released into Jindabyne. All are welcome to join us, but remember that you will need covered in shoes as part of our WHS. Feel free to forward this message on. If you can let me know if you can attend it would be appreciated. Thredbo river is still running well after last weeks rain and things have Improved. Most fish are taking the Nymphs in the running waters with the dry’s doing there work in the still waters. Now the rainbows have finished running up stream this is the time to start looking for the browns with all this good weather and the insects are starting to get about you should see more and more browns out hunting around. The Diggings, ski tube, Thredbo Village, don’t forget the little Thredbo river. Eucumbene river is running well from top to bottom most off the fishing has been doing well up high around Kiandra and sawyers. so it sound like you should be doing more casting then looking hope that helps ? 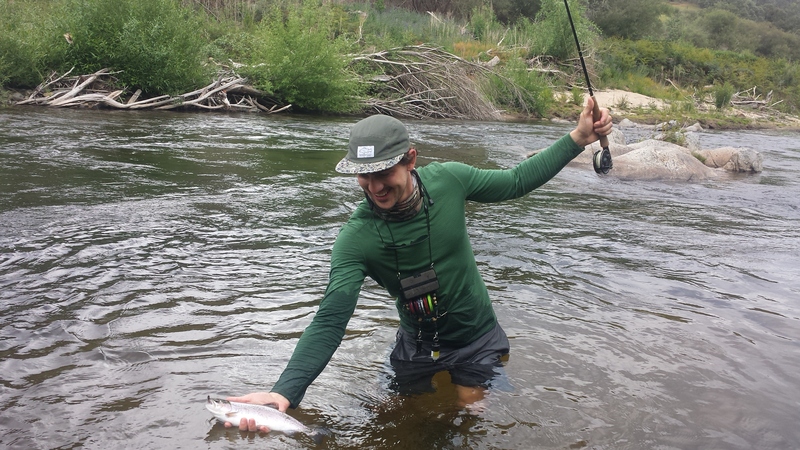 Great fishing around Tumut at the moment with plenty of action on the surface. Reports were ok with rainbows and brown moving up and down most parts off the river well worth a look this weekend after all that rain. All other rivers around the snowy mountains are fishing well so now the weather is getting better it’s time to start looking. Don’t forget the Monaro rivers are all running well and they all should have fish so it’s time to get out there. Lake Eucumbene reports have been up and down with the fly fishing remember it’s only early yet and things will change once the mudeyes start we should start seeing more rainbows about. good reports have been coming around Middlingbank, Rushes, frying pan as I said before this is the time to start using them Nymphs go small size 14,16,18 black, brown seem to be the best. Lake Jindabyne things are looking good over on the west side off the lake there has been plenty off browns in close and out wide polaroiding around the lake has been great with good results coming in remember early mornings are the best. Still getting good reports on rainbows in the lake big and small. Things are early yet and the best is yet to happen once we get more insects and mudeyes moving around Jindy will be good this year. Trolling Eucumbene has been good all the fishing has been down the bottom end off the lake around Seven gates, Middlingbank, Rushes, Wainui bay, and the Middlingban Peninsula. all fish have been taking Rapalas, Tassies, Blades the best has been all the minnow lures spotted dogs and the berkley spotted dogs minnows as well. Best lures are spotted dogs Rapala and Berkley, Blades, and tassies. Lake Jindabyne much the same as Lake Eucumbene fishing is good on the troll most fish have been down around 12 to 15 foot at jindy that’s on a sunny day if the clouds are about get to the top. Jindabyne has been good with the rainbows nice and fat and hitting hard it’s good to see the lake fishing well. Best time are early mornings late afternoons. Bait fishing Eucumbene has been really good in places Seven gates, Rushes, middlingbank all on worms not many fish have been taking the Power bait at the moment but if the rainbow do come on things will change yes they will come on soon there has been some good reports off rainbows moving around out wide and some have been close with some lucky fishermen getting them. Overall the bait fishing has been good but remember only down at the bottom end off the lake only. 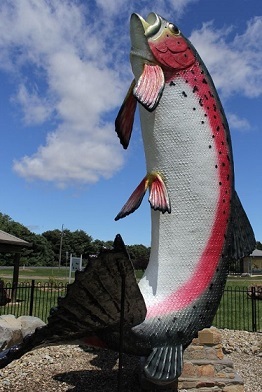 Good reports from the locals up at Tantangara with the bait fishing again all on worms good reports off rainbows and browns but the rainbows would not touch the power bait? Over at Jindabyne things have been ok on the power bait and worms the best thing about jindy is the rainbows are nice and fat and the browns are full off yabbies and there on the bite. Overall the bait fishing is good on all lakes.